the Pacific Ocean to a 6,500-foot elevation in central Idaho's mountains to spawn. With an expected increase in solar radiation and air temperature in the lower Snake River basin, river and power operators at Wednesday's Technical Management Team meeting began to use what could be the last available water from Dworshak Dam until September to cool water in August in the Lower Granite Dam tailrace. While other juvenile and adult salmon continue to pass lower Snake River projects, a bi-product of keeping water temperatures cool at Lower Granite Dam is that occasionally an endangered sockeye salmon shows up at the dam, as occurred this week, according to Russ Keifer of Idaho Department of Fish and Game. While the trap and haul operation officially ended August 5, Keifer said the Nez Perce Tribe and IDFG received an extension of their permit from NOAA Fisheries to continue the operation, but it is more on an on-call basis. Rather than have a transfer truck ready at all times, IDFG will keep the fish on site overnight and transfer the fish the next morning. Three sockeye salmon showed up Tuesday this week, Keifer said. They were kept at the dam and hauled the next day to the Eagle Hatchery near Boise, Idaho. That brings the tally of sockeye hauled to the hatchery to 50 fish, he said. Nine more fish have been trapped in the Stanley Basin, bringing the total to 59 trapped fish. "As long as we think this (trap and haul) is productive, we'd like to continue to do so," he concluded. Through Thursday, 403 sockeye had passed Lower Granite Dam about 30 miles from Lewiston, Idaho, but concerns continue that only a fraction of the fish will make it on their own into the Sawtooth Basin. "It's too early to say how many have died" and we won't know that for a while, according to Paul Wagner of NOAA Fisheries. The southern-most population of sockeye salmon in the world swims 900 miles from the Pacific Ocean to a 6,500-foot elevation in central Idaho's mountains to spawn. The average tailwater temperature at Lower Granite Dam on Thursday was about 67 degrees Fahrenheit, but Steve Hall of the U.S. Army Corps of Engineers in Walla Walla said water temperatures in the Snake River Basin will likely rise due to two factors: higher outdoor temperatures and clear skies, resulting in more solar radiation, are expected, and a three-day release of warmer water from Idaho Power's Hells Canyon Dam begins this weekend to accommodate the local boating community. The discharge of cold water from Dworshak Dam on the North Fork of the Clearwater River has been at 5,600 cubic feet per second since last week, Hall said, and with that amount of water the reservoir is on target to reach an elevation of 1,535 feet by August 31. However, with higher water temperatures expected this weekend, fisheries managers worried about fish passage at Lower Granite Dam if the temperature rose above 68 degrees. "We probably have a couple of days we can pass 7.5 kcfs," Hall said, mindful of the reservoir's elevation limit, "but there's not much beyond that. It depends a lot on inflows. If we have more thunderstorm activity, we'll have water to work with." Inflow into the reservoir is currently 0.5 kcfs and last week inflow was 0.7 kcfs. The flow increase would need to be made by Thursday at midnight, he said, if the water is to benefit fish at Lower Granite Dam by the weekend. Water from Dworshak Dam takes up to 72 hours to arrive at Granite. After a short caucus, fisheries managers at TMT decided to increase Dworshak's outflow to 7.5 kcfs beginning midnight Thursday, August 13, for two full days, reducing outflows to a range of 5.4 kcfs to 5.6 kcfs Saturday at midnight, and then to revisit the operation next week. This may be the last pulse of water available this month from Dworshak to keep the Lower Granite Dam tailwater within the temperature parameter of 68 degrees set by a NOAA Fisheries biological opinion. The required Dworshak reservoir elevation of 1,535 feet is to ensure there will be enough cold water for salmon migrations in September and later. 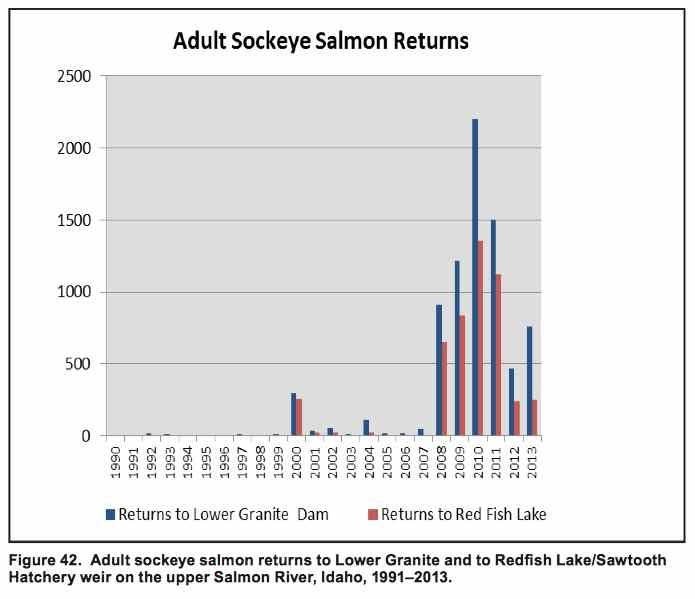 As of August 13, the Fish Passage Center reports that 510,245 sockeye, most headed to Central Washington, had reached Bonneville Dam, but counts have progressively diminished upstream, to 429,001 at The Dalles, and 277,979 at McNary Dam. "This is the second highest sockeye run on record, said Dan Rawding, Washington Department of Fish and Wildlife, at this week's Northwest Power and Conservation Council meeting in Missoula, Montana. "But, just 277,000 passed McNary Dam." That's just a 54 percent conversion rate, but still 150 percent of the 10-year average for sockeye passage by that date. "However, we can't account for 200,000 and that's due to water temperature," he said, adding that sockeye are less tolerant to higher temperatures than other adult salmon. "Fish are making it up the Wenatchee River, but the jury's still out for the Okanagan River." For Snake River sockeye, as of Thursday, August 13, 1027 were counted at Ice Harbor Dam, 873 at Lower Monumental Dam, 558 at Little Goose Dam, and just 403 at Lower Granite Dam. One known sockeye has naturally migrated up the Salmon River to central Idaho. At this week's Council meeting, Ritchie Graves of NOAA Fisheries, the federal agency that implements the Endangered Species Act for salmon, said Northwest fishery managers coordinated their efforts well this year in response to the extraordinary conditions and plan to issue a report this fall. Graves said it is scientifically impossible to tell whether the 2015 conditions were an aberration or a harbinger of future summers, a new normal. "Personally, I think we need to plan for events like this to recur," he said. As for sturgeon, Tom Rien of the Oregon Department of Fish and Wildlife told the Council at its two-day Missoula gathering that 134 "oversized" sturgeon -- large fish of spawning age - have been found dead in the Columbia. There are many possible causes for the die-off, he said, including prolonged exposure to warm water and gorging on dead sockeye. Dead spring Chinook salmon and steelhead also have been found in the Columbia, notably downstream of Bonneville Dam, Rien said.